My husband, son and I drove our college junior’s belongings down to his off-campus apartment. It’s the same unit where he lived last year, but we save over $1200 by choosing a ten-month lease and emptying the apartment over the summer. School doesn’t start until September 24th, but my husband’s having surgery on his ankle/foot and we wanted to enlist his help before he became temporarily handicapped. We paid our son’s first month’s rent and appreciated that it was $300 less than normal, as I’d negotiated a repeat renter bonus. They’d offered this incentive to tenants who re-upped by a certain date. We missed the deadline, but I asked to get the bonus anyway, which they agreed to. It just goes to show that doesn’t hurt to ask for discounts! We didn’t buy anything new for the apartment, just set him back up with the same perfectly nice thrifted supplies from last year. I took a 12-hour shift of RN on-call for the hospital instead of staying at home without pay. (This happens when the labor and delivery unit is uncharacteristically slow.) I would have received time-and-a-half pay had they needed me, and was a worthwhile gamble even though it tethered me to being available to come in at a moment’s notice. I did another big shopping trip at Winco Foods. For those not familiar with this chain of no frills (and employee owned) grocery stores, you are missing out on some amazing bargains. The freshest of produce, an expansive bulk section and huge variety of stock make this store a bargain hunter’s dream. Plus, they refund you 6¢ per reusable bag that you bring from home! I finished a library copy of Less, by Andrew Sean Greer, I helped my mother clean her guest cottage between tenants, I listened to a couple of podcasts from Pour Not Poor, I gave away an ancient (think 1950s!) but perfectly functional mattress and boxspring set through our Buy Nothing Group, I put some classic monster movie DVDs on hold through my public library, my husband cleaned our gutters and I binged the Jack Ryan series through my mother’s Amazon Prime account. 1. Our repaved streets are higher than they used to be causing water to run down from the street, across our lawn, and into the basement. The Mister wanted to buy something to make a dam, but I put out a request on freecycle and picked up carpet remnants. He’s building a diversion system like the ones in Paris. 2. A visiting relative wound up hospitalized for ten days. His wife stayed with us and took us out to eat twice. Saved her a lot on hotel bills and kept her calmer having people to visit with. 3. We bought the $20/week parking pass for the hospital. 4. I’ve been sort of meal planning. That is to say, I write down all the dishes I can make with what’s in the house. When I make a given dish depends on that day’s energy and time available. Is the city going to fix the street issue? Because that just isn’t right. Good luck. Happened here and no help at all. So exhausting and upsetting trying to “fight City Hall”. The Mister is working on it. Has called several departments, but no one is claiming jurisdiction. I really like your#4 for meal planning, and am going to use it! Great idea! That’s how I meal plan also. I really love the frugal 5! I love to read and get ideas from others. Thank you for this! 1. Well today, hubby was at our local Bilo grocery store and spotted something on the ground. It was a catalina coupon for free eggs when you spend $10. He was spending $10, so free eggs! 2. I keep thinking about how many gift bags I use in a year. I mentioned making my own. Hubby said, but Lisa, they are only a $1 at the dollar store, smile. He’s usually better about saving money. I have looked into making them online, and I plan to do this with old newspapers, or the brown paper that comes in amazon packaging or wrapping paper. There are videos on Youtube. 3. I keep a running lost of Christmas and birthday gift recipients to work on during the year. 4. I washed my car and his truck at the same time . 5. Selling some items, giving some items away to friends, and donating some. Also you can use a hot glue gun on the bottom and top. I LOVE buying spices at Winco. 5 cents for a small amount of nutmeg? Yes, please! Refill that cumin bottle for 50 cents? Sounds great! Doing all the usual: thrifted outfits, brown bagging breakfast and lunch, hanging laundry to dry, driving with a light foot. Our wonderful vet removed a broken claw from our dog’s toe and did not charge us. DH brought home some fancy thermal tumblers given away to people attending a presentation about solar energy. Enjoyigh several free e-books. 1. Husband and I cut each other’s hair. As usual, glad his hair is curly so it hides my mistakes. 2. My best trade of the year: a friend came over and I could not help but show off weeks of hard work, namely my counter and cupboard full of canned goods from my garden. She owns a cleaning business and offered me a complete housecleaning for 35 jars of food, her selection. She took mostly jams and pickles and smoking hot tomato jam, saying she was doing her Christmas shopping. Given the price of grocery store jams and pickles and so on, I think we both got a fair deal. I would much rather can than clean my house! 3. It frosted at my house two night ago so I dug up all of my dahlias and begonias, so I can save the tubers to replant next year. This is thrifty, given that last year I saw a dinner plate dahlia cost $25 at the local nursery. 5. An acquaintance is moving out of Alaska and she called me saying that she would be embarrassed to offer this stuff to anyone else but she knows I am “beyond thrifty” and would not take it as an insult. She gave me a box of personal and home cleaning products: 2 bottles of shampoo, a pump hand soap, three unopened gallons of vinegar, 13 dishwasher tablets, part of a box of SOS pads and a new jug of Caldrea all purpose cleanser. If this is an insult, feel free to insult me anytime! P.S. I, too, was impressed that you held on to furniture from the 1050s! I am nothing if not impressive! #4 — soooo true, isn’t it?!?! LOVE that she considered you “beyond thrifty”! I think people often think they shouldn’t give away something if the box has been opened. I’m with you, “feel free to insult me anytime” too! First week of Spring and the birds and bees have appeared in a frenzy to lap up the sunshine and feed on the nectars. Magpies yodelling, Kookaburras laughing and honeyeaters slurping at the flowers with background noises of humans on their lawn mowers, a cacophony of sounds. 4. Result : jars of marmalade, to eat and giveaway but also ready for the plant/garage sale in a few weeks. Seeds, cuttings and plants all growing ready for sale as a means to host my family for Christmas gathering this year. 5. Fed neighbors chickens while they were traveling and had dozens of eggs in exchange for greens and weeds I pulled in the garden. Yvette, thank you for hosting us all for a mini-trip to Australia! Anyway, thanks for the great “audio recording”” from Down Under. Give my regards to the magpies, kookaburras, and honeyeaters! 1. Since school started this week I figured traffic would be crazy so I ran very few errands. I did stop at Aldi to pick up sale priced produce and stopped at Walgreen’s to use a bonus coupon on sale priced candy (which I stored away for Halloween). 2. Meals have been based on what we have in the house (as they usually are). I also found an old bag of split peas and made a big pot of soup for lunches. 3. I’ve been bagging up yard waste. It’s good exercise and it’s picked up every two weeks, a service that is part of our county property tax bill. 4. We loaned money to a friend when their college financial aid was temporarily messed up. They were able to pay their U-bill on time. The issue has since been resolved, they received a refund and paid us back today. It was more frugal for them but I was glad to be able to help so that they didn’t have to borrow money and pay interest. 5. I baked oatmeal raisin cookies for a friend that has supplied me with tons of tomatoes and a lot of butternut squashes from their garden this year. I also gave a some of the cookies to a friend that lives alone and has a sweet tooth. We ate only a few of the cookies, that’s one of my favorite ways to make baked goods (sharing most). I would giggle when reading the frugal tip, freeze leftover wine. I’d ask myself, “when do I ever have leftover wine”? Well, surprise, surprise, now I’m not drinking alcohol I had leftover white wine from a birthday lunch I hosted. There’s now two serve in the freezer to be used when I make Risotto. I hosted seven people for lunch, including a vegan, a vegetarian who can’t take dairy and a Coeliac. Included in the meal was a vegan pumpkin walnut risotto which we all enjoyed. I waited until the white wine drinkers arrived with their bottles and then added a glass of their wine to the dish as we had none in the house. The lunch was to celebrate two birthdays and Father’s Day (in Sept in Australia). Total cost of a Pork Pot Roast, risotto, roast vegetables, homemade gluten-free Yorkshire Puddings (popovers) and free-flowing home brewed beer, cider and ginger beer was about $20. Someone brought a vegan dessert to share. We have found a new to us leather sofa. Buying second hand has saved us at least $1000. From the same people, we also brought some art by an artist I admire. I’d looked at buying some of her art online. That’s my birthday present sorted! I retired early but after a year picked up some teaching at our local community college. I love it and enjoy having some extra money coming in. Taking lunch and coffee into work. 1. Spent another half an hour dealing with an insurance reimbursement issue for the two mandatory vaccinations my son had to have to continue at college last winter after an outbreak of meningitis. Shots were $192 each, law requires insurance to cover, but they weren’t direct billed and it’s been a real headache to get the claim paid. Still I was told today a check will be in the mail. Dealing with this type of thing is my least favorite in the whole world but I did it! 2. Been doing great taking bus to/from work 80% of time. Sometimes I need a car to get somewhere right after work but otherwise, bus it is! 3. Wanted a Starbucks this a.m. but didn’t have one. 5. Got a new credit card to avoid foreign transaction fees on upcoming Italy trip. Will pay balance off monthly. No annual charge for first year. 1. Found 2 quarters and a penny this week, bringing this year’s “found on the ground” money total to $100.51. It’s been an unusually fruitful year for found money, and this total will probably never happen again in my lifetime. Heck, I’m pretty sure I’ll never even get close to that amount again. 2. I’m planning a grocery shopping spree with the found money for later this month (I always spend my found on the ground money in September). Half will be spent at a local farmers market, stocking up on things I don’t grow/produce/make and thus will keep the money local – very local. The other half will go toward grocery store purchases, again with stocking up in mind. I’m so excited to be doing this it’s ridiculous. Found on the ground money becomes food! 3. Guests this past holiday weekend brought up steaks and all the trimmings for a steakhouse type dinner. Totally unnecessary, but very much appreciated. 4. Found out that we could get a military discount from Verizon. Yes there are other providers that offer cheaper plans but Verizon is the most reliable cell service in our neck of the woods (and we are quite literally in the woods). Dh uploaded the necessary documents to get a veterans discount. 5. Received 50% off this month’s internet bill due to waiting home most of the day for a morning appointment that they had cancelled…but neglected to tell us that little fact. 1. Got 4 porterhouse steaks on sale for $4.99 a pound. Grilled 2 and put the other 2 in the freezer for another special treat. Could have spent $40 a person at a nice restaurant for the same steak. Enjoyed it more at home. 2. Made 10 pints and 1 quart of dill pickles. Cucumbers are growing like crazy this year.Garden is still giving me pounds of food everyday. 3. Watching my sister’s dog for the next 2+ weeks while she travels. She cleaned out her fridge and brought us lettuce, lemons, carrots, and ginger. We both hate food waste. 4. It has been hot so I did the sheets and hung them outside. They were dry in an hour. 5. I have been using up all of the samples of items we have. I poured a small body wash into a hand soap pump and added water. Been using hotel bar of soap for the last week in the shower. Using hotel shampoo and conditioner too. Found a plane travel bag that the kids got when they went to Italy. I am using the toothpaste that was in it. Never saw such a small one. I’m on day 3 so far. Using a mini lotion that was in the travel bag too. I’ve never heard anything bad about Winco. Everyone who ever talks about it makes me jealous! 1. I came in under budget for groceries this week, so that made me happy. 2. There was a movie I wanted to see in the theater, but I never made it. It showed up in the ‘coming next week!! !’ section of my library yesterday, so I put a hold on it. I’m 15th in line, but I’ve been patient this long, I can be patient a little longer. 5. I made my son a ton of lunches using leftovers and shoved them in the freezer. Now I just take them out at night, pack his lunch and put it in the fridge, and they’re thawed and ready to eat by the time he has lunch at school. Win all around! 1) Needed to replace my Diva cup so I cashed in Swagbucks for a $25 GC that covered most of it. 2) Opened a tub of yogurt that was moldy, so I emailed and received 2 free coupons in the mail. 3) My dd needed a book for school so I requested it from the library rather than buying it. 4) Finally were able to turn off the AC again and hopefully it is off for the year. Reached 95 here this week! 5) Dh rode his bike to work twice this week, we all packed lunches for school all week, feeding the rabbit with veggie scraps and kale from the garden. 1. I picked up my contact lenses at Costco. I bought a years worth at once taking advantage of the $75 discount making them only $125 for the year. I also filled my car with gas and bought a rotisserie chicken at the same time. 2. While on the Costco side of town I stopped at their Aldi since mine is closed for the month for remodeling. I picked up the few items I needed. So much cheaper. I love Aldi. 3. I stopped at a garage sale on my way to the dog park. I found my daughter a spoon rest that is perfect for her new apartment kitchen for 50 cents. I also found a new package of rubber spatula’s with the size that I have been wanting for a quarter and for fifty cents I bought a new package of vegetable brushes that will go in one daughter stocking for Christmas. 4. My water heater has been making a funny noise for some time. I thought I was just imagining it. It turns out the vent pipe to the outside had fallen apart and it was venting into my basement. I called my plumber who works on the side and he came and fixed it for me and only charged me $20 since I was just a few miles away and on his way home anyway. 5. I picked my daughter up from school using my hybrid vehicle. I will return her with half my half gallon of milk since neither of us can finish one before it spoils. We will also make some spaghetti sauce for her using up some ground beef in my freezer. She can freeze it and use it for meals while at school. Our Aldi on this end of town is losing for a month for remodeling, too. The CSA will be done for the year, also. I am declaring October “Eat the Freezer Down!” month. After posting 25 frugal items on 8-28 (ok, that was a one month summary) & 5 more on 9-6, can I up the ante to 10 in 1 day? You betcha! 1. I always get up to prep DD’s and DH’s breakfasts, even on my days off including Friday. This prevents DH’s temptation to run through the local fast food drive through for a breakfast burrito. 2. I took time to meal plan, prep a detailed grocery list and print off various email coupons. 3. I hatched together a lunch of odds & ends. In prep for defrosting freezer, I found a needing-to-be-eaten chicken & cheese frozen sandwich which was fine heated & dipped in left-over fast food cheese sauce. I followed it up with another needing-to-be-eaten previously frozen handmade sticky rice dessert given to me by an Asian client. Fast & delicious! 4. I enjoyed 4 free samples at my local grocery and scored a triple coupon redemption. I find it challenging to score a double redemption but rarely have I made it a triple. Between a store coupon, a manufacturer coupon that came with an item and another one in a mailed coupon flyer, I got a 24 oz. brand name bottle of mayo with avocado oil with hint of lime and a 20 oz. brand name bottle of catsup sweetened with honey for 75 cents each. 5. Next stop was the spice store to redeem email coupon for flat out free 2 – ¼ cups of spices. I selected the 2 that I use most often as I was completely out of 1 and nearly out of the other. 6. Next stop was Aldi. I took more time perusing their offerings as I just started to shop there this summer and am transitioning to buying more & more items. I continue to be dumbfounded when they tell me the final bill, as the items are shockingly inexpensive like beautiful grapes for 79 cents/#. 7. I decided to try an Aldi extra-large take & bake pizza for dinner at literally 50% lower cost than the take & bake pizza shop. (It was delicious, btw). 8. Next stop was refrigerating/freezing cold purchases & exchanging vehicles with DD. I took her vehicle for an oil change and new wiper blades. I had called ahead so had an appt. (time is $) & spent my time reading a Half Price book that my daughter gifted me at Christmas. I also had a $10 coupon from visiting their website, so essentially one of her wiper blades came free. 9. Next stop was the discount retailer located across the street from the oil change place where I do my other 50% of shopping. I always assess their day-old bakery items & found a garlic herb sliced Italian bread loaf for 68 cents which will perfectly accompany a meal later this weekend. 10. We enjoyed our Aldi pizza with another episode of “Longmire” on Netflix. We utilize our Netflix subscription frequently & have seen some very good series that we otherwise wouldn’t have watched. I LOVE LONGMIRE!!! Yes, caps were intentional. Big Longmire fan here, too. Great show! Since we don’t watch prime-time tv of any kind, had never heard of “Longmire” but glad we happened to see it on Netflix. We actually enjoy watching episodes of a show back-to-back & have come across some very memorable series. Sadly, we finished “Longmire” tonight so will be looking for a replacement. DH and I loved Longmire too! So sad to see it end. I LOVED Longmire. I watched it when it was on a regular cable channel (A&E, I think?). I was SO disappointed when the channel dropped it. Even though I don’t do Netflix (yet), I figured the DVDs would eventually make their way to the used book store and/or library, and they have. 1. Sold a comforter and two shams for my parents for $40. I live in a more populated area, so it seems to be easier to sell stuff for me, than for them. 2. Walked with a friend this morning, and she treated me to coffee. 3. Picked up a free wooden bedside table, and for the first time I’m painting furniture with leftover paint. I did have to buy primer, and spray paint for the hardware, but I think it’ll be worth it. My daughter moves in to her first apartment shortly, and should be able to use it. I’m hopefull it will turn out. 4. Binge watching “30 Rock” on Netflix. I find Tina Fey hilarious, and it cheers me up to laugh for a few minutes every evening. 5. My pear tree is dropping lots of fruit, so pear crumble and pear sauce is in our future. 1. On a reading binge of library books lately. Going to watch a library movie tonight. 2. Took the dogs to the dog park and got them very tired out. A tired dog is a good dog. 3. Went to several yard and estate sales. Spent little money. Got a set of king size sheets, a new comforter to replace the animal ravaged one (which I will donate to the animal shelter for bedding) , place mats, craft supplies, presents for others, 6 extension cords for .50 each. I never have enough of those. 4. Working on Christmas crafts which will sell in Nov.
5. Braved the social security office to get husband’s payments started and mine increased. (He had issues with errors on his profile that made registering on line difficult.) The wait was bad but the process was easy and the people so helpful. 1. Celebrated my and my SIL’s annual birthday weekend at my house. We enjoy catching up and each other’s company. We agree to one dinner out and this year we chose a restaurant that we both had gift cards for. 2. We visited our city’s farmer market and went to 2 thrift stores together. I purchased a brand new flannel shirt for my husband and 4 books for $4. I love Shetland. I was sad when I reached the end but it was so good I may just start over. I just read that they’re getting ready to film Season 5! Have you watched Vera? Took me an episode to “get into it” but I am about to start season 8. I love finding a show that has many seasons to look forward to watching. 1. Researching grocery flyers online ahead of time to reduce my grocery bill. Sticking to my list. Using competitor’s coupons. Takes time, but if I do this once a week, it helps cut costs! 2. Got a box of pretty art glass from an older relative who is downsizing. Divided it up into four piles: keep, save for future gifts, give away free, sell. Already sold a few small items. 3. Included in the box were some beautiful unused cards. Giving some away, saving the rest to send when I want to send some cheer. 4. Purged and got two bags of things to take to Goodwill. Putting sheet sets in pillowcases so they can sort them easier, I hope. 5. DH is recovering from surgery, and my workplace gave me a card with cash. Decided to spend it on some help for doing yardwork that DH can’t do right now. Our friend’s son said he would do it for free, but we paid him so he then found a few other things to do for us that was helpful. 1. We went to visit my son yesterday at college. Its a 6 hour roundtrip, but we did it in one day- didn’t stay over. 2. Filled up hisand our car with Costco gas- .18 cheaper than nearby gas stations. Also got toilet tissue and paper towels there. Shared some with college son. 3. Left at 6 am to meet him for breakfast, which is a cheaper meal out. 4. Made a batch of my laundry detergent yesterday. 5. Had dinner with friends at home yesterday. Bought a pizza at Costco and a bagged salad, as this was our 6 hours in the car day, but cheaper than going out. Caught up on our taped America’s Got Talent episodes. Yes, we lead exciting lives! It seems crazy that they would be willing for him to sign a ten month lease just to move back in two months later. Perhaps they rent it out short term for peak season?? Otherwise it seems crazy on the landlord’s part. 1-We have 3 birthdays in a two week span in our house, all cakes are homemade by me at a massive savings & the kids have always preferred “mom” cakes. 2- Still line drying the clothes, with cooler, shorter days it takes a bit of planning. 3-having an eat from the freezer/pantry challenge month. Only buying what need or products that will be free by combining store points/checkout 51 & coupons. 5-Currently binging on the UK series “Eat Well for Less”, it’s interesting and encouraging. Thanks to a NCA Facebook post for the introduction to it. Also thank to the posters here I just downloaded Nomadland, free from the library of course. Thanks to NCA community I don’t feel odd and I am constantly encouraged and inspired to up my frugal game. I have found several episodes on YouTube and plan to watch these. Thank you for the recommendation. 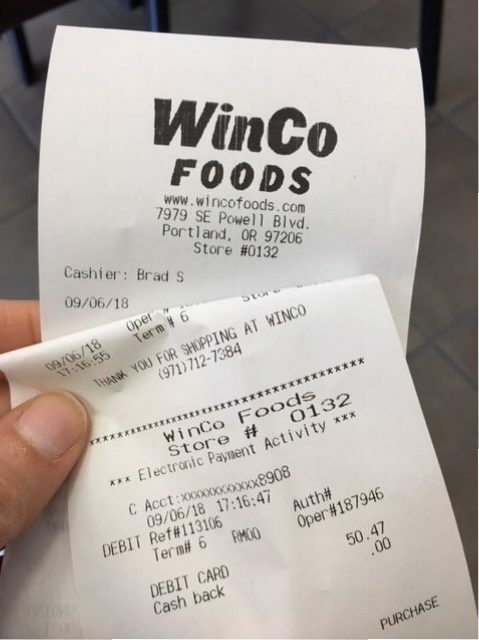 They just opened a new Winco in the City, but it’s 50 miles from us, so I’ll have to wait to make a trip in to see what they have. Sounds wonderful!! 1)Listening to the smooth jazz station on my Amazon Fire TV. I LOVE their music playlists – they are awesome and make doing housework so much better! 2) I signed up for two Tech conferences this month. Both were free to register for, especially since I’ll be working the OKWIT table at one. 3) I found two brand new Vendor t-shirts in the trash at work. They were wrapped in plastic and the only thing in the garbage can, so I picked them out and gave them to my daughter for their teenage sons. They were black and only had the Vendor’s letters on them and boys rarely care anyway, when it comes to t-shirts. 4) I picked up veggies and stew meat yesterday, to make pot of hot stew and some cornbread for dinner tonight. It’s FINALLY cool weather and that means soup and stews on the weekends again. YAY!! Which, also, means leftovers on Mondays. I love meals that last for 2-3 days! 5) One of my chihuahuas is having digestive issues. I hate to spend money at the Vets office, when it’s something I can fix here at home. I remembered I had bought a bottle of activated charcoal a few months back, so I gave her a dose of that about an 1/2 hour ago. I’ll give her another few doses before bedtime tonight and hopefully that will do the trick. I have a feeling it’s something she ate outside. I’m with you…YAY for the cool weather! I’m making chili in my crock pot today and we’ll have leftovers for a few days. It’s just DH and I, so one batch definitely stretches. By the third day there’s not usually enough left for two full bowls, so I boil up some elbow macaroni and put the chili over it like spaghetti sauce. Delish! We always make chili dogs with the last bits of chili or occasionally frito chili pies…not even a little bit healthy. This might be a Southern thing but it’s basically corn chips slathered in chili and cheese. I use leftover chili for hotdogs, spaghetti sauce and chili/cheese pie. It’s never wasted in our house!! Thanks for the leftover chili ideas Jennifer and ouvickie! Never heard of frito chili and chili cheese pies before. Both sound delicious. And of course I’ve heard of chili dogs but never thought to make them! Thanks for the nudge! Skipped the call to Taco Bell after church and made it home for leftovers. Set a tray of carrot sticks and dip (ranch, greek yogurt, and additional salt) which satisfied everyone until I got the leftovers plated. Doing school today on the weekend to make room for a LEGOLAND outing this week. We get more fun out of a day in the middle of the school week than on the weekend. Flexibility is the name of the game with homeschooling. Still losing weight with our health network’s free class… Down 11 lbs now….Did somebody say snack?!?!! Got a free Science workbook from a curriculum exchange. It has reproducible pages, so I copied a few pages for my kids. Husband had to run to Walmart for some work supplies, and I gave him a 2 item list for groceries to fill in the blank for the week. Saves me a trip and a little gas money. Yea for the weight loss. What program is the health network using? It’s based off the MyPlate plan. 1. Cooked dinner from refrig/pantry on Friday night. Watched a Free movie on Netflix. 2. Went to pilates (pre paid) on Saturday a.m.
5. Put together a “wedding gift” for a guy friend getting married next month. Friend loves to cook and soon to be spouse is a neat freak. I had new rubbermaid and other kitchen storage supplies I’ll be sending. Even have a greeting card. 1) Hiked today and enjoyed the beautiful Colorado weather. I paid $7 admission and visited an amazing state park that was new to me. They were celebrating history days so I stopped mid-hike and enjoyed the historic reenactments. 2) Grocery shopped at two different stores, something I don’t always take time for. I stocked up on loss leaders at both stores, plus used coupons for my weekly needs. 3) Made dinner at home all three nights this weekend. This is rare and I deserve a pat on the back! I really hate cooking. 4) Worked on call yesterday. Got called in, and will have additional money in my paycheck for the extra time worked. 5) Wearing thrifted clothes, driving the old, paid-off car, watching Netflix and reading library books. I have been trouble being frugal lately. I have been short on time, but I have gotten some things right. I am going to try to list fft each week in the hopes that accountability will help me be a little more aware of what I am doing! 1. Am using Mary’s idea of making meal plans around what is in house/fridge, in order to use up what we have and avoid needless shopping and food waste. I made some delicious meals that I wouldn’t have otherwise, and am freeing up freezer/refrigerator space for rehearsal dinner foods. 2. Bringing homemade breakfast and lunch to work every day, and looking forward to picking some blackberries when the rain lets up! 3. Reading my library books. Also, wanting to be able to listen to some books that are on cds, but my car cd player is broken and apparently not repairable (car is 18 yrs old), so I bought a discman cd on eBay for $12, including car adapter and cassette adapter, in order to listen to stories on way to work. The books for my book club were only available in cd or on audible, which would have been $15/month. 4. Getting house ready for guests and for rehearsal dinner for daughter’s wedding in two weeks, which will help out the people who will be staying here, and be a lot of fun, too! 5. Used dryer rack to dry clothes, donated some clothes rather than buy more hangers, have done so so much yard work it has become great exercise and yard is looking very nice. I feel better after making this list. I have some good habits after all! thank you everyone for inspiration. 1. I went far out of my way to return a jackfruit I bought. When I opened it, it was not good. They refunded enough to pay for my other purchases, including beer for my husband and cider for me. I only ended up spending 45 cents. 2. I picked up a coffee table for my niece’s refugee group and a brand new carry-in suitcase for me. Now we have enough suitcases for everyone in the family! When we travel, we only pack carry-ons, so this will be nice for the future. 3. I only turned on the air conditioning one day last week, and I think we’ll be able to do without again today. It is forecast to be 89, but if I close up the house early we should be ok. I will be doing laundry, and that will dry quickly. 4. Darning socks I knit for my dad. Not frugal for me, but he’ll get to keep wearing the socks, which makes me happy. I will also put that on the list of what he might want for Christmas this year. 5. I’ve been reading a lot about visible mending, celebrating maintenance of items instead of replacement. So I’ve been mending socks, jeans that I would have otherwise just replaced, looking at mending my husbands worn hem. I finally caught up on laundry, pricing and other stuff for the shop, so I can start a new project around the house. Sorry Roberta – the message below was intended as a reply to your comment. Your comment about visible mending sparked my interest. Are you referring to mending that is purposeful and not meant to hide the repair? I have spent countless hours doing mending while raising DD & waiting at her various activities and in all those years, I only observed one other Mom with a needle and thread sewing ties on to ballet toe shoes. Is mending becoming a lost art? Is there a book or resource that you would recommend that delves into this topic? Thanks Juhli. I looked at the resources your mentioned and although I like the concept, it appears way beyond my very basic sewing skills. Would be wonderful for creative sewing types though. Wow! I am so excited to learn about the “visible mending idea!” The pinterest images are inspiring. Thank you, Juhli, for the resources. And Lisa, your careful reading and comment, brought Juhli’s mention to my attention, so thank you, too! A favorite pair of jeans just bit the dust, I thought, until I saw this. I think some of the visible mending is not so difficult as it appears, and am going to try it. I wouldn’t let your minimal skills put you off. Embrace mending as a chance to improve your skills, and if you hate the way it turns out, you can get rid of your item in good conscience because it was damaged anyway! My mending isn’t art, but I hope that in the long run it will be better. Depending on what I mend, I match or don’t match the thread (or yarn) to the background. I also encourage going ahead and giving it a try. I think there are much simpler visible mends. I used to put patches on the knees of my son’s pants and sometimes used a patterned/plaid fabric. You could sew on a heart shaped patch. Think patches on sweater elbows, etc. 1. Planning on what curtains I want in each room. During fall cleaning every year, after I’ve washed my windows and curtains, I switch them up in different rooms than before. This way, each room gets a fresh look every year. 2.M My town began a new program available to homeowners 60 plus. It entails working for the town for 40 or 80 hours, and receiving $500 or $1000, respectively, off your property tax bill. I’m turning 60 in April and will sign up. 4.Lamenting not living near a Winco but we do have a Market Basket with impressive low prices. The bulk of my shopping is here. 5. Been sick so in the house=no spending. I’m intrigued by your number #2. Can you tell me what kind of work would be involved? I’d love something like that here! I pay a ridiculous amount of property tax. I’ve already spoken with the town employee who coordinates it and she said it’s wherever the town needs help at the time. She told me about one woman who worked doing some paperwork for the fire department and others who worked within the school department. I’m pretty flexible so I’m not concerned about which department I will be working in. I will have to see if our small town does this. I know the city i grew up in discounted property taxes for seniors. i would have no problem volunteering my time for a tax discount! Another “unadvertised” discount for seniors in our town is 20% off our water and sewer bills. We heard about this through word of mouth. Lucky we heard about it around the time DH was turning 62 so we didn’t miss out on the savings. 1. We have pretty non-productive raspberry bushes and apple tree, but get a few free items off them – everything counts. 2. Visited apple orchard – bought only the great cider – their fruit is way too expensive. Free experience watching cider presses. 3. Cooked fancy meal tonight which was much more frugal than almost any meal in a restaurant. 4. Looking for a new to us car. Driving our ancient not always reliable vehicles is cost effective because I question whether it is a necessary trip every time I go out. 5. Making home-made laundry detergent to supplement supply until I find a good sale. 4. Found free study guides online for Frankenstein, so I will not have to buy or make one…thank goodness! I was able to go with my son to a free outdoor concert put on by the city symphony. It was a great night with flamenco dancers and opera singers joining in for some pieces as well. Looking through events offered by the library, I was able to sign my son up for two events, including an escape room activity and a Halloween party. The grocery store obviously tracks my purchases (slightly creepy!) and sent me coupons for $3.00 off any $15.00 meat purchase as well as coupons for deli meat and baguettes. I made sure to use them this week since I had been lax about that before. Was able to get three free books through Scholastic because I purchased approved items. I got two for my youngest to put away for Christmas and one for my niece for Christmas as well. On the weekends I usually take my kids out for a snack. Was able to use the McDonald’s app to get a BOGO on Egg McMuffins. That plus a $1.00 Iced Coffee for me made a cheap outing! Frugal Fail: We decided to drive to a town about 150 miles north for the Labor Day holiday. A semi truck kicked up a piece of tire which cracked my bumper and caused a piece (little switch cover) to pop off. Won’t be super cheap to fix, but no one was hurt which is what is most important. 2. Reading a stack of decluttering books from the library. Favorite so far: New Minimalism: Decluttering and Design for Sustainable, Intentional Living. The great thing about this book is that it’s about finding the spot where you have “enough” (as opposed to the starker image most of us have of minimalism). The authors are big on having fewer things, but having higher quality, and how to be less wasteful. 3. I was tired of using my phone just to check the time, so I decided to go back to wearing a watch. I had a cool one that used to be my aunt’s, but it wasn’t running and needed a band. The design is art deco and looks that vintage, but it turns out it’s not that old. All it needed was a battery, a quick clean, and the band. So I was able to support a local watchmaker and have a new-t0-me watch for ~$25. 4. Bought several cartons of Silk soymilk. Free coupon for one carton, the rest were on sale for the cheapest price in my city. 5. Annual Eat Local Week. I try to do this as much as possible anyway, but dinner tonight included a caprese salad with tomatoes and basil from the garden, sauteed green beans (from garden), and salmon with dill from my garden and local garlic. Also harvesting plums, eggplant, herbs, several types of tomatoes, zucchini, and cucumbers. Don’t know if this counts as frugal but I love the story so… My friend called me up, asking if my 8yo daughter wanted to come to her place to help her own kids sell extra veggies from her garden. She said “Knowing you, I know you won’t find this weird…”. I said “Are you kidding me? I thing this is awesome! No food waste and money coming in!”. So my daughter went, had fun all day and came back with 23$ (reward for her work). I was hesitant for her to accept the money, but my friend was adamant that she had worked hard for it. 23$ for an 8yo is a lot of money! She was really happy about it. Hard work pays off! 1. OK, so… I am getting older, getting very tired and lately I spend most of my weekends cleaning the house. So… I bought a Robo-Vac/floor washer. I know, I know… it’s not frugal but I felt I should spend what’s left of my life living more and cleaning less. The frugal part: I bought it at Costco where it cost a little more but I have the luxury of bringing it back with no problem if it fails or if I don’t like it. (Last year Costco refunded my money on a 10-year-old freestanding air conditioner because the exhaust hoses were no longer available anywhere… and the refund was their suggestion!) Will let you all know if it is worth the investment. 2. My son is helping me with big home maintenance items. He works in construction and knows how to do these things. I will pay him but I feel good about him getting some extra money and having my things repaired while I’m home. The big win here is that I get to enjoy my grown son’s company while we work together on this stuff. 1. Made an impulse trip to my parent’s yesterday and found some killer vintage holiday decorations that I used as a kid to use this year to spruce up my new apartment. Slightly creepy santas are my vibe! 2. Took the opportunity to go to Wegman’s while I was in NY’s Southern Tier as well and stocked the heck up on reasonably priced bulk meats, quality produce, and frozen products. A bag of frozen veggies there was 99 cents–same where I live is $3! 3. Continuing the trend of making my own coffee instead of buying out. Got sticker shock the other day going to starbucks with a coworker. My frugal brain is evolving! 4. Starting a side gig for the holidays working in catering. Optimistic that the flood of holiday parties and weddings will help pad my savings account. 5. Trying to look at the changing of the seasons as a time to go shopping in my own closet instead of buying new clothes. Everything is a few years old and the mall is calling, but I will resist! Katy, when I saw you read the book “Less” I got it from the public library because I assumed it had something to do with downsizing/minimalism. What a surprise when I started reading! I have to say, though, it was an excellent book and am so glad you mentioned it in your blog. 1) I’ve been using Hollar and SmileAmazon to buy some Christmas gifts for my grandddaughters. Not free or thrifted, but stuff I know they will use and play with for much less than retail. I loathe Black Friday and Holiday shopping in the retail stores. 2) We’re having a potluck/diaper/baby shower for one of our Techs tomorrow. I told everyone I’d provide the decorated cupcakes, if they’d bring the rest of the food. I bought the baby shower themed paper plates and napkins at the Dollar Tree. We’re keeping it simple, since the baby is already over 2 months old and his wife’s friends gave her a shower before the baby was born. 3) Sticking to eating frozen entrees I bought from Smart Saver, rather than eating out. I keep pretzels, mixed nuts and popcorn – most bought from the Dollar Tree, for snacks at home. Hubby works late and doesn’t eat dinner Wednesday through Friday, so I eat leftovers or finger food and he eats snack food, if he’s hungry when he gets home. It saves a lot on groceries. 4) A vendor provided BBQ food for lunch the other day, which meant we’ve had some leftovers in the work fridge. Free sweet ice tea and snacks for the past few days. 5) We had steak, baked potatoes and veggies for dinner on Sunday. I was able to stretch the leftovers for at least 2 more meals at home.